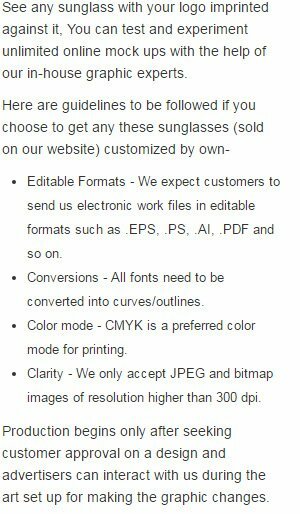 Custom Imprinted Glow in the Dark Sunglasses w/ Clear Lenses is one of our best sellers and it is favored by advertisers who wish to highlight their brand in darkness. The brand logos imprinted on the frames of these sunglasses can glow even in dark. This custom sunglass features UV400 protection and its body is made up of high quality plastic, which makes it easier to carry. Advertisers targeting wide demographics can always go for it because it will help them to address different types of people with tastes for visual illusions.